Adequate legal communication is essential to companies to ensure truthful, accurate information exchange and enables to do morally-correct decision making. 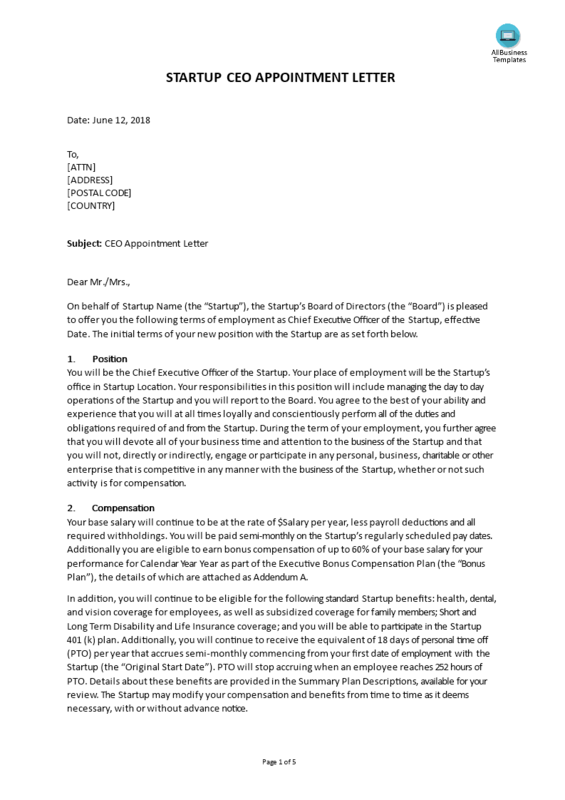 This Appointment Chief Executive Officer Letter template covers the most important subjects and will help you to structure and communicate in a professional and legal way with the new CEO of the Startup Company. Short and exact: make sure you keep it short and have just plain words there that are unnecessary, the document should be brief but informative enough so the one who is receiving can understand it. Be straightforward and to the point. Informative: be specific and informative. Like all legal documents, you need to give detailed information. Download this professional CEO Appointment Letter template now. Completing letters has never been simpler!